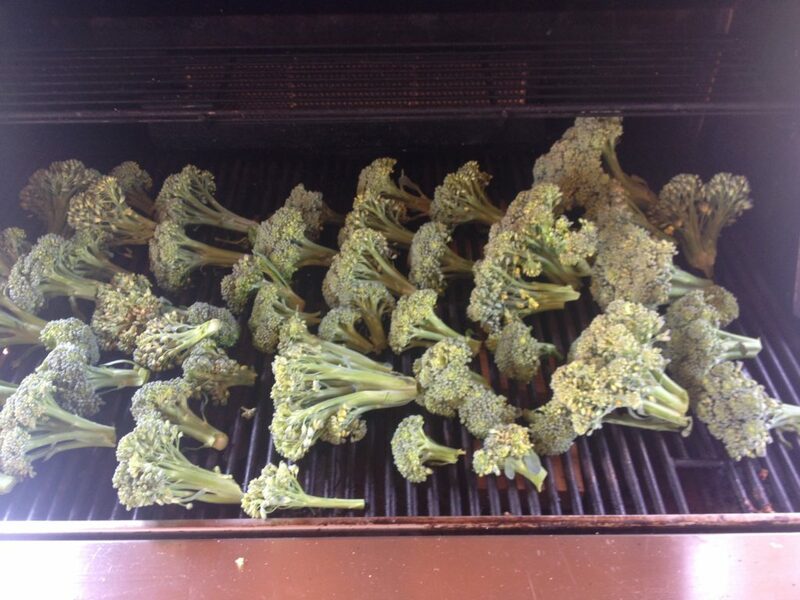 Getting ready for a Grilling/Roasting Broccoli extravaganza! Using Smokinlicious® double filet or single filet wood chunks on your gas grill for a grilling/roasting broccoli experience. 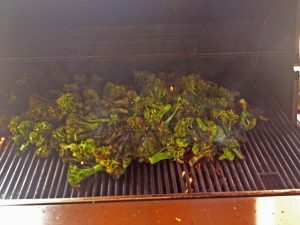 Grilled Broccoli using broccoli florets adds woodflavoring for broccoli vegan! Call it Roasted broccoli, wood roasted broccoli or smoked fresh broccoli just add it to your roasted broccoli recipes! An LP/Gas grill of any brand or size. 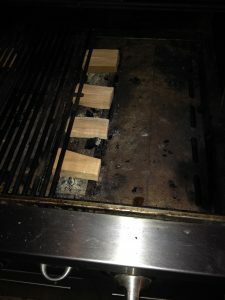 Adding special wood flavoring to your LP/Gas grill can be so easy by following these simple steps: make sure your grill is clean from significant grease build up. Remove the grilling grates and determine how much space is between the diffuser and the grilling grate. The diffuser is the plate covering the units gas burner (do not remove the cover). Once you have the measurement select the SmokinLicious® wood chunk size that will best fit the area. Based on your measurement, select either the Single Filet which is ~4 inches or the Double Filet which is ~2 inches. Remove the cooking grates from the grill. Then strategically place the wood chunks over the heat diffuser. This is the metal piece covering the actually gas burner(s). If the SmokinLicious® wood chunks are fresh, then you can add them directly to the unit without pre-soaking them. If not, you may want to consider a lite soaking of about 15 minutes. Today, I want my broccoli to just have the natural flavour of the wood so I’m using them un-soaked. Know that you can add additional flavouring through the soaking process by soaking the wood in a liquid like wine, beer, or juice. Then replace the grills back over the SmokinLicious® wood chunks! Make sure the grates are securely seated back on the unit. If there is a lot of space on your unit between the diffuser and the grate you may want to consider a SmokinLicious® single filet or block item. Now light the unit and set to a low heat setting. Bring the unit up to a temperature of about 180 degrees F. Do not overheat the unit as the goal is to delay ignition of the wood. I slice up the broccoli head into what I call serving slices (you can get to make individual florets or larger sizes, totally up to you) and add them on the grill grates. Keep in mind, you want to be able to move the finished product from the grill to the serving dish without too much issue. The actual sizing of the pieces doesn’t matter as all sizes will take in the natural wood flavour. It’s best to break down the head into florets in order to ensure charring on all portions of the broccoli. Then I close the cover of the grill for the cooking/smoking process. Open the lid of the LP/gas grill after about 4-5 minutes of cook time. Remember, your heat setting should remain on low. You should see that the SmokinLicious® “Double” filet wood chunks have ignited! The burning of the wood will produce heat and smoke within the unit. Open the lid every 5 minutes or so and move the broccoli florets around to make sure you have an even searing on each piece. After 7-10 minutes, the broccoli should be showing a color change due to the wood flavonoids infusion. You should see the charring on the outside of the florets as well as see the smoke being produced by the wood that is burning under the grate. I use these ‘hot” spots to move the food over them which will ensure complete “char” on the outside of each floret. A great smoky taste to the finished result! All that’s left is to move the florets to a serving dish, add some butter, salt and fresh ground pepper to complete the dish. Feel free to experiment with different variations on a finish as everything is fair game. Keep in mind too, that broccoli freezes really well, especially when broken down in to florets. Be sure to take advantage of the growing season and freeze your finished wood roasted broccoli for use when fresh broccoli is unavailable.